Young people being mentored by Christian charity XLP were described as "an inspiration to us all" by the Duke and Duchess of Cambridge on a unique visit last week. The royal couple were on their last official engagement before the birth of their second child, visiting cutting edge projects on inner city estates in London's Gipsy Hill and Sydenham. The three hours they spent with XLP saw them visit the church in Gipsy Hill where the charity first started. They then went on to visit XLP’s stripped out and refurbished former double decker bus in Sydenham, which reaches out to young people in the area who are facing some serious challenges in their lives, including gang culture, family breakdown and addiction. The Duke and Duchess immediately put everyone at ease through their genuine interest and even enjoying a joke with the young people – many of whom were very nervous meeting royalty for the first time. The young people shared their own powerful, personal stories of overcoming incredibly tough situations. Among these was Nadine who is one of 16 children and experienced family breakdown. She was made homeless at the age of 16, living rough on the streets for 2.5 years. XLP s help and mentoring of Nadine means she now has a home, a job and a real hope for the future. Nadine, now 18, was one of several young people from XLP’s Arts programme performing at the event. She was speaking on stage just before she performed a poignant and powerful poem she had written for the event, and summed up her experience of the charity: “XLP saved my life really. What performing today for the royal couple means for me was that I get the opportunity to share my passion for honest, raw poetry with people of importance. Keziah Regan, daughter of XLP’s founder and CEO, Patrick Regan, delighted the couple with the presentation of a very special gift: a babygro designed specially for the soon to be new arrival, with an inspirational message about the amazing potential of young people growing up in difficult circumstances “I refuse to believe this is a lost generation” (see photo top right). XLP’s Founder and CEO believes young people dealing with difficult life issues can have a positive future: “To develop as a whole person, you need three things: a sense of self-worth, a sense of belonging and the means by which to cope, and this is what XLP is all about – showing young people their own potential and helping them reach it," says Patrick. The young people at Hazel Grove had a rare opportunity to spend time discussing the harrowing issues they face on a daily basis with the royal couple. For some, XLP has become their family in the aftermath of their own families breaking down. 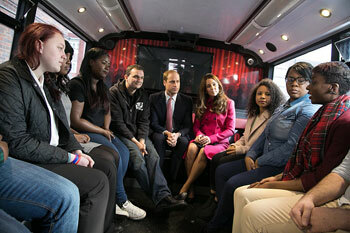 Nina shared her story with the Duke and Duchess saying: “Coming from a broken home doesn’t mean I’m broken”. XLP has helped her see her own amazing potential and how her life and choices don’t have to be determined by the challenges she faces in life. Many of the young people went on to talk about their experiences with issues like mental health and domestic violence. The Duke and Duchess responded with encouraging words of their own and telling the young people that they had a bright future and should be proud of themselves. The Duke added that they “were an inspiration to us all” especially in light of the terrible things they had experienced. The Duke and Duchess were very impressed by the young people and the charity describing it as “Incredible and revolutionary”.